Los Fragmentos del Albaicín, Two Sides of Dreams, Sept 2018. A joyful experience is unavoidably going to fade. Your memories started being blurred, details are gone, like falling rain through a sewer. Soon, scenes you have gone through becoming abstract concepts. You forgot how sunlight shines on stairs with hundreds of years of history, you ignore the sound of water dripping on an old church; you remember walked pass a crossroad and saw three people, but you cannot recall the hair colour of one of these passers-by. Memories floats in the air of your palace of mind, leaking to an invisible crack on walls. Like television signal being interfered, frames were replaced by non-sense images. There is nothing you can do to hold on your memories that established on these fragments. While fragmentos being weathered into dusts, my vision still helplessly stareing at them, trying to capture the vest last moment of each fading piece. Surprisingly, subconsciousness managed to archive the entire experience but only display parts of it randomly in your dreams. Their definitions are always incredibly clear, but that would not help you to bring them on the surface. Dreams are not going to last very long. After a period that feels like a blink of an eye, daylight wakes you up. Rewind of a past lifetime shattered. The next approach of the same dream takes an everlasting time to wait. People seem to be irrelevant to a culture can love, respect and understand the same view just as every local. This is precisely something the colossal puzzle of Desperation Archive would like to express: the desperation of being torn away from a treasured part of life due to the misunderstanding of others. Political hostility, prejudice in values, the indifference of knowing others, they all, are existing problems in the international society. I wish everyone that pursuing freedom will be treated friendly with opened-hearts at the destination. Los Fragmentos del Albaicín, 2018. 8 cm * 6 cm * 91 pieces. Watercolour with various materials on canvas. Collected by Shanghai Xirui Co., Ltd. The transparency of canvas and the photography curtain allowed me to demonstrate a detailed, reproduced Albaicín emotionally from my memory. With the flexible use of light, two spaces created two perspectives during the display. Physically it granted the work to show the visualised blur of fading memories. On the other hand, the small size and an extremely compact composition forced audiences to walk really close in order to explore every piece of it. For those who have been to Albaicín, this design of the format may guide them to match images with their previous experiments; for those whom never been there before, a close observation of images one-by-one forcibly coerced viewers to go through at least a certain amount of these watercolours. The display was settled in a local Café. Later of the day, it was purchased by a trading company in Shanghai. 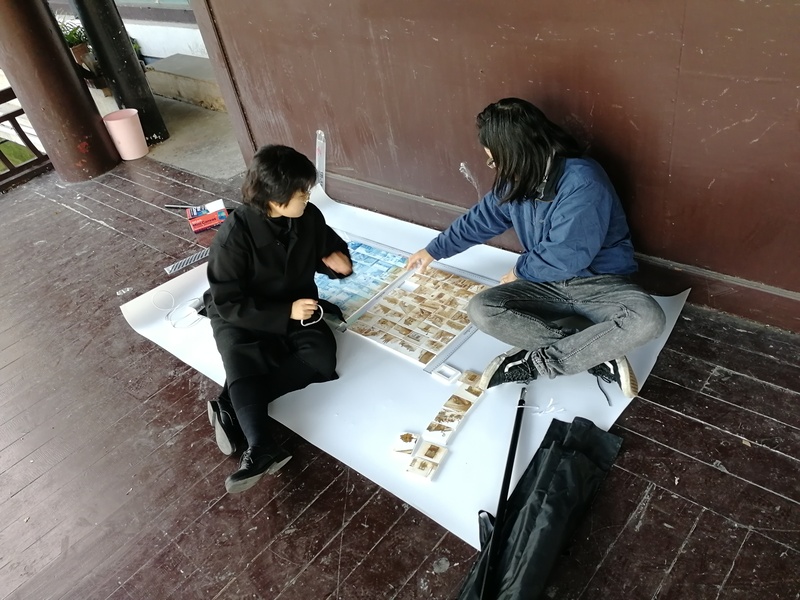 The project consists of a massive number of watercolour pieces as well as creative writing in Chinese. It was designed to fit a part of the political pursuit of Desperation Archive. 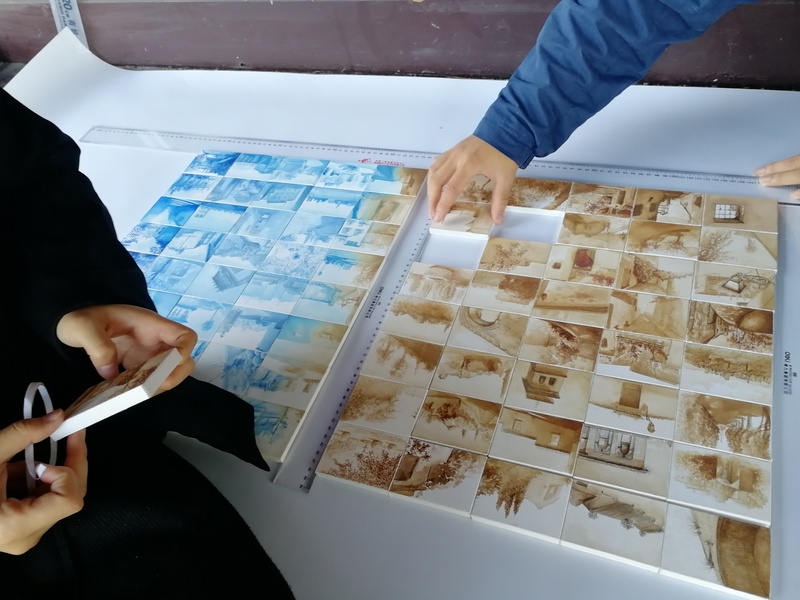 The project was based on photographic records I have collected by two field trips to Granada. It has demonstrated 91 random memories about Albaicín, an urban site that strongly connected with personal emotions and feelings. Photography is also included in the display of the project. The transparency of canvas and the curtain were used to create another dimension of viewing this work. It shows the decay of memories that eventually decides the un-blur can only be achieved in the shift of observation dimension which in this case, was defined as dreaming. Through the massive amount of physical work, the project demonstrated the resignation of a forcible cut off between civil liberty of travel and international isolationism. Political hostility, prejudice in values, the indifference of knowing others, they all are existed problems in the international society. These fixed impressions have been obstructing communications between China and other countries. I believe too many unnecessary difficulties have been added to Chinese people who would like to pay any visit to other regions due to hostility formed during the cold war. Now its embers still ask innocents to pay for crimes they did not commit. It is true that there are people with harmful intentions could hide amount those ordinary visitors. However I believe until administrations practically have some essential changes that convert such hostility between different ideologies, innocent people should be be treated unfriendly for their nationalities. Foreigners seem to be irrelevant to a culture can also love, respect and understand the same view just as every local. However, currently, the possibility of a temporary relocation on a global scale is so limited that treasured memories have to be kept in such a complicated manner. Los Fragmentos del Albaicín Part 2, Sept 2018.